I don’t know who is spreading around those nasty rumors about hollandaise sauce but I am here to tell you that they aren’t true! In my opinion hollandaise sauce is one of the easiest and fastest sauces to prepare. It has even become one of my lazy day sauces for times when I don’t feel like putting much effort into cooking. The beauty of hollandaise is that there is basically no guess work involved. The recipe is a fairly specific formula and once you have it down you can do it with your eyes closed. You can buy imitation hollandaise in a packet but the velvety smooth texture and delicate tang of the real thing is more than worth the minuscule effort required to prepare it from scratch. Of course as with just about any recipe there are countless variations, but this is a very basic and absolutely perfect version of this classic sauce. Also, I want to mention that my preparation of hollandaise sauce involves cooking the egg yolk. Some preparations use raw egg yolk. I like to cook the egg yolk because with the method that I use, the resulting sauce is thicker than if made with raw egg yolks. I am comfortable with consuming raw eggs but I understand why people may have an aversion to it. So rejoice! If raw eggs aren’t your thing than you can still make fresh hollandaise using this recipe. This recipe will yield about 1 cup of hollandaise sauce. Melted of course. The white foam that you can see on the butter is whey protein. This is ordinary unclarified butter, just the way it would be if melted down from solid butter. A lot of hollandaise sauce recipes call for clarified butter. This one does not. If, however, you do choose to use clarified butter you will need to thin the finished hollandaise sauce with a little water because it will end up with a texture like mayonnaise. Some people like their hollandaise sauce the texture of mayonnaise, however, so if you are in that camp then you will not have to thin it. I like my hollandaise thick and rich, but still pourable, like the consistency of a thick gravy. That is what you will end up with if you use unclarified butter. The choice is yours. Generally the juice of half of a small lemon will equal about a tablespoon. It is very very important that you use FRESH lemon juice! Do NOT use bottled lemon juice. I made the mistake of using bottled lemon juice once and the resulting sauce was putrid tasting. Use fresh. I have heard of people using lime juice as a substitute with good results, though the lime flavour is pronounced, so if that will work for the dish that you are preparing, then feel free to try it. Cayenne pepper is what I use and is the most popular pepper to use. White pepper comes second. Use either one. Salt to taste. I usually just put a pinch in and am happy with the results but some people like to use a bit more. Feel free to experiment. I use sea salt but ordinary table salt will work too. First you must melt your butter, juice your lemon, and separate the egg yolks from the whites. Place the yolks into a stainless steel bowl or small saucepan. You can reserve the whites for another use. Pour the 1 tablespoon of fresh lemon juice into the bowl with the egg yolks. Now you must cook the egg yolks until they are thick and smooth. You can use the classic approach and set up a double boiler (boil a pot of water and place the bowl or smaller saucepan on top of the pot with the gently simmering water, creating a gentle heat for the eggs to cook in) or you can use Chef John‘s approach and simply hold the bowl a couple inches over the burner. This is the way I always do it (I learned it from Chef John) and it really is quick and easy! So if you are going to do it the way I do then you will want to put an oven mitt on or at least hold the bowl with a dry cloth. Whisking vigorously hold the bowl an inch over a burner that is on medium low to low heat. This works with a gas or electric stove. If using gas I would recommend a lower setting and if using electric make it medium low and give the stove a minute to heat up before you begin the cooking process. Let the eggs cook slowly. Lift the bowl a little here and there to give the eggs a break from the heat while constantly whisking. You want to be careful not to scramble the eggs. This whole cooking process will only take about two minutes. Before you know it you will have a mixture that looks like the picture below. You will notice that the mixture starts to resist the whisk slightly more and it will be thick enough that it sort of coats the bottom of the bowl when its tilted. Also when you lift the whisk out of the mixture some of it will stick to the whisk and fall back into the bowl in ribbons. The main indication that the yolks are fully cooked, however, is the presence of steam. The moment you see a small wisp of steam coming out of the bowl take it off of the heat. It is fully cooked. Even after taking it off of the heat keep whisking. There is enough residual heat on the bowl that it will still be cooking and at this point the eggs are very close to scrambling. So give it another good 30 seconds of whisking to help it cool off a bit, then get ready to emulsify the butter! Put the bowl down on a towel or wooden cutting board, or anything that can withstand heat, because the bowl will still be hot (in the picture you can see that I put it onto a plate). Now it is time to emulsify to butter into the egg yolk mixture. This is easy as pie so don’t let all those horror stories worry you. The important thing here is patience. Whatever you do, do NOT dump all that butter into your egg mixture and whisk away thinking that someday it will emulsify. It never will. So what you must do is pour a little tiny bit of butter into your egg mixture. Lets say for now add about a teaspoon. Do not measure, that would be a waste of time, I’m just giving a rough estimate here. Now WHISK! WHISK! WHISK! quickly, until all the butter is incorporated. Add a bit more, again a tiny amount. WHISK! WHISK! WHISK! Add another tiny amount. WHISK! WHISK ! WHISK! Ok its a little tedious, sure, but its not hard. It just takes a bit of patience. Seriously though the whole process doesn’t even take very long. I’d say it takes me around 8 minutes to make this recipe from start to finish. And really, its mindless work. Get into a rhythm and DON’T get impatient and try to cheat by adding more butter than you should, or you will be sorry. After you have made a few (lets say…. 6 or so) of these initial tiny butter additions and thoroughly whisked them in, you can get a bit braver and start adding a little more at a time, like a tablespoon or so. Continue adding approximate tablespoons and whisking thoroughly until you have used up all of the butter. You now have hollandaise sauce! That wasn’t so bad was it? The texture should be smooth and creamy with no hint of oiliness and no chunks. It should be very thick but pourable, perhaps just barely pourable, and it is perfect. Now all that remains is to season it. Now take a moment and appreciate the majesty of your creation. See how it coats the spoon? Lovely! Serve your hollandaise immediately. Do not reheat. It is meant to be eaten only lukewarm. The unfortunate thing about hollandaise sauce is that it cannot really be stored. You have to make it right before you want to eat it. If you try to chill it the emulsification will break and you will be left with an oily liquidy mess. So only make what you intend on using right away. The sauce will last at room temperature for up to an hour generally before it breaks. If it does break, one trick is to get a bowl with about a tablespoon of warm water and slowly add the broken sauce into the water. It should re-emulsify by doing this. If you want to keep the sauce handy for more than an hour you can set up a double boiler and keep the water warm but not hot and keep the hollandaise sauce on top of the water to maintain the proper temperature (which is just a little warmer than body temperature). I never have to worry about any of that stuff though because I usually use my sauce right away. So I know I got fairly long winded with explanations because there ARE some things you have to keep in mind when making and using hollandaise sauce, but that does not mean that it is difficult. You will find that the process is far less complicated than it seems at first. Just try to make it once and you will be hooked. I guarantee it. Knorr will rue your new discovery. No cheap knock off can match the quality of the real thing. Let your Eggs Benedict know that you care. Show your Chicken Florentine a good time. After all, they do so much for you. **Additional tip: You can make a raw version of hollandaise sauce using this exact same technique and recipe with two differences; Do not cook the egg yolks, and use CLARIFIED BUTTER. Using unclarified butter along with raw egg yolks will create a runny hollandaise sauce. It will still taste good, but hollandaise sauce should be thick. 1. Melt your butter, juice your lemon, and separate the egg yolks from the whites. Reserve the whites for another use, and put the yolks into a stainless steel bowl or small saucepan. 2. Pour the 1 tablespoon of fresh lemon juice into the bowl with the egg yolks. 3. Place the bowl over a gentle heat (either by using a double boiler, or simply holding the bowl over the stove burner set at low to medium low heat. If using the latter approach be sure to use an oven mitt or rag to hold the bowl because it will become hot). Constantly whisk the yolks while allowing the heat to rise slowly. The eggs will cook and thicken in one to three minutes if using the second approach. If using a double boiler it will take a little longer. 4. Once the yolks are thickened and you can see small wisps of steam rising out of them take the bowl off of the heat immediately and continue to whisk quickly for at least another 30 seconds in order to keep the yolks from cooking too much. 5. Now add a small amount of melted butter (around a teaspoon) and whisk it in quickly. Add another teaspoon and repeat a few times. No need to count an exact amount but do this at least 6 times or so. 6. After you have gotten the emulsion going you can start adding a little bit more in between whisks. About a tablespoon at a time will work. Continue adding the butter one tablespoon at a time and whisking to incorporate thoroughly until all of the butter is used up and you have a thick smooth sauce. 7. Add a dash of cayenne pepper and a pinch of salt (or to taste) and mix into the sauce well. 8. Do not heat or chill the sauce. Serve immediately after preparing. Thanks for the demonstration. I have always been told that using uncooked eggs is just mayonnaise. Hi! Nope, the main difference between hollandaise and mayonnaise is that you use butter for hollandaise and oil for mayonnaise. They are also seasoned slightly differently. At some point I will be posting my recipe for mayonnaise and then you can see just how similar, yet different they really are. If it did not emulsify (become smooth and creamy) then it will basically just seem like lemony butter. Be sure to add the butter in very VERY small amounts especially at first and whisk it well. Repeat this process adding the butter little by little. If you are successful it will look like the pictures in my post. It will be smooth, thick and creamy. Make sure you season it with cayenne and salt too. You don’t need much but it is an important touch. A well made hollandaise should have a velvety smooth mouth feel, and should have a nice tang to it. Since the majority of the sauce is butter it will have bit of a butteryness to it as well, but since it is emulsified with the egg yolk It definitely have a different personality than simply butter. So if you feel that you emulsified well, and if you seasoned correctly, and if it sounds like you got the right mouth feel, and you didn’t like the tangyness /butteryness of it, you may simply not like hollandaise sauce. But if anything here sounds off then you may just need to try the recipe again and be very careful to follow all the steps and take your time. is this recipe suitable for pregnant women? i am craving hollandaise sauce so bad but have only ever made the raw egg version! the packets and jars are absolutley rubbish!!! Sara, yes this is safe. Just make sure that you cook the eggs well. Obviously not to the point that they start to form curds (scrambling) but until they are nice and thick and you see steam rising. Egg whites will not work. There has to be some fat for emulsification. There is a sauce surprisingly similar to hollandaise that you may want to try, however. I plan on posting the recipe here eventually but I’ll give you an idea for now. It is basically a sauce known as “Avgolemono Sauce”, but my take on it is not traditional, since I make it specifically to mimick hollandaise. You still need to use egg yolk, but egg yolk is good for you anyway. There are calories in them but you do need SOME calories! Plus it will be diluted with lemon juice and chicken stock so it is really a healthy sauce. The amounts are rough since I cook usually by feel and only really measure out my ingredients when I am preparing an article, but you should be able to follow these instructions. -As much chicken stock as you need to get the sauce to the thickness you desire. Homemade unsalted chicken stock is best, but if you use store bought, get low sodium or low (or no) salt broth. when the mixture is thick and you see steam, take it off the heat and add a tiny amount of chicken broth at a time until you have a sauce the thickness you desire. It may just be a few tablespoons or maybe up to a cup. I have not made this sauce in a while so I do not remember. You’ll just have to feel it out. season with a touch of salt and white or cayenne pepper. I use this sauce over fish and when I do I put a generous amount of dill weed into it. Delicious over salmon or just about any other fish! It is also great over chicken, eggs, or just about anything you would use holladaise sauce for. It will be a but thinner than hollandaise, and wont be quite as smooth and rich, but this is as close as I think you can get to a healthy hollandaise sauce. I made a sauce very similar to Hollandaise but it used vinegar and rendered bacon grease. It tasted good but came out too thick. What should I add to make it thinner? more water or bacon grease? or should I cook it less? Vinegar is also acceptable for Hollandaise. I prefer lemon juice, but I do think that vinegar is more popular in Europe. So the only real difference between this and yours is the fat, bacon grease instead of butter. I imagine it turned out pretty thick since bacon grease has no water in it, unlike butter which does have water. Simply add a little bit of tepid water to your finished sauce at a time and mix well until you achieve the consistency you desire. Adding more grease will just make it thicker and will eventually cause the sauce to break. It sounds really delicious. Is there a name to this sauce? or is it just a variation of Holandaise? Thanks for the recipe but it’s just so long and a lot of talk. I mean sorry but… thought this was a lazy recipe..I couldn’t even get half way through it, it’s like a whole book. I recommend you writing your recipes cookbook style, short yet informative. Also, as I explained in the post the explanations take longer to say than the actions to actually do. This really is pretty quick and easy. I’m amazed you managed to reply so politely. I thank you for the explanation, because although I do know how to make hollandaise, I’m always glad to improve my technique and enjoyed the explanation of the differences between cooked and uncooked yolks and clarified and whole butter. Yes, I know some people like more detailed explanations and some like simple step by step instructions. I try to please everyone but that is impossible! Soon I will be posting videos along with the pictural guide and cookbook style recipe. No doubt people will find something more to complain about then, haha! No reason to get all fussy though just because someone complains. If it is a legitimate complaint I am happy to try to rectify it, and if it is just pettiness then I just roll it off my back. This is not a life and death matter, it is just cooking! No reason to lose our heads! I am happy to hear that you enjoyed to article. Thanks for taking the time to comment. The lemon is there purely for flavour. If an acid tang is not appropriate for the sauce or gravy you want to make just leave it out. But just so you know, you can substitute white vinegar, or even reduced white wine for a slightly different kind of tang. Buttermilk would also add a tang. I do not know if buttermilk would affect the outcome as I have never heard of using it in an egg based sauce, not that that mean it isn’t done, just a topic I am ignorant about! I make a similar sauce made with egg yolks, lemon, and chicken stock. You could try that without the lemon. Maybe a splash of heavy cream at the end for extra richness plus seasonings. You would have to play around with it! Also be careful if you plan to bake a pie with an egg based sauce inside, it might curdle the eggs since the heat has to be kept gentle, typically. I hope you can work it out. Let us know if you find success! What is the sauce called that you make with chicken stock? I make home made hollandaise similar to your recipe above. I never wanted to try a dish with hollandaise at a restaurant in fear it would not taste like mine. I recently worked up the courage to do so, twice. Both times it said hollandaise but all I could taste was chicken stock. Needless to say I was very disappointed. when the mixture is thick and you see steam, take it off the heat and add a tiny amount of chicken broth at a time until you have a sauce the thickness you desire. It may just be a few tablespoons or maybe up to a half cup. I have not made this sauce in a while so I do not remember. You’ll just have to feel it out. I doubt that most restaurants would make this sauce and try to pass it off as Hollandaise. It can take the place of Hollandaise in a dish, but is very obviously something else. 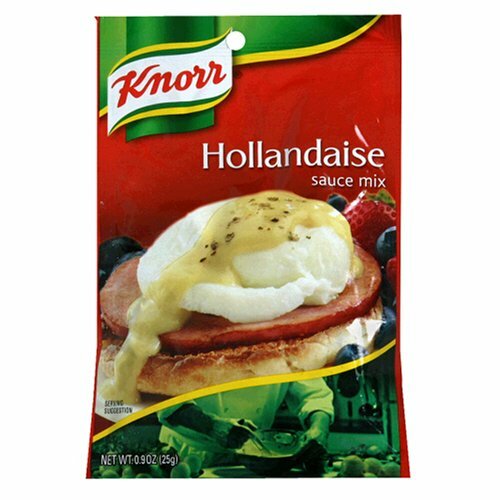 What you probably experienced was a packaged Hollandaise sauce mix, that likely had some kind of crappy imitation bullion in there for added fake meaty flavour. I have never had a proper Hollandaise as a restaurant. It just is not going to happen unless you go to a place that charges 75 bucks just for the appetizer. You are quite welcome. I love to hear when people get good use out of my recipe posts. Thanks for reading. 1. Mine came out too thin for my taste, and I followed the ingredient list. How would I do this recipe with uncooked eggs and clarified butter? (I understand how to clarify butter – just skim the foam off the top.) But how do you heat the eggs up to emulsify the butter without cooking the eggs? Im confused about the timing of this process with raw eggs especially when I melt the butter and clarify it in my pyrex measuring cup in the microwave. 2. If you have a small, high walled metal mixing bowl like I do, the tops dont really heat up that much and you dont need to wear an oven mit, or use a towel or hot pad. I found using a bulky towel to hold while I’m whisking risked me dropping it a lot more than using my bare hands. And finally: THANK YOU SO MUCH! I absolutely LOVE that I can make Hollandaise. I love this stuff. I’m not scared of making it anymore and I feel like a great cook now. I am super proud of myself! Now, I’ve gonna experiment and perfect this until mine rivals the thick gooey richness of my mother’s! A lot of things can impact the thickness of the finished product even if you followed the recipe to a T. The size of the yolks in eggs can vary greatly. The moisture content in butter can also vary. Usually, this ingredient list that I put together works perfectly to make a pretty thick sauce. If for some reason you think it came out too thin, you can simply try adding more butter first. The more fat added to the sauce, the thicker it will get, until it breaks. Try a test batch. Don’t be afraid, just let it break if it breaks. Keep adding more butter until you think you like the consistency instead of following an exact measurement. Try using unclarified or clarified butter as you see fit. You can use either one with the cooked egg method. Clarified butter will add less moisture and will give you an even thicker sauce. If you truly wish to make a raw egg hollandaise sauce, then all you have to do is melt your butter as usual, clarify it or not, your choice, and add it to the cool egg yolks while the butter is fairly warm, but not piping hot. Do everything the same way as though you are using cooked eggs. Using raw yolks will impart more liquid into the sauce so this will possibly lead you to a thinner sauce. I strongly recommend, if you want a thick sauce, to cook the yolks. Try cooking the yolks and using clarified butter next time. You will likely end up with hollandaise sauce that holds its shape. Kind of like mayonnaise. If this is too thick for your liking you can simply add a dash or two of warm water until it is the texture you are looking for. Eggs Benedict- poached egg and applewood smoked ham on roasted garlic toast with waimanalo greens, cherry tomatoes, and hollandaise sauce with smoked paprika. This is following the recipe above, cooking the eggs and clarifying the butter. It was delicious!! I think I’m gunna gain a good ten pounds now that I can make this. I’m gunna put it on everything!! That looks stunning! It looks like you worked out the thickness problem. Did you have to add a little water after all the the butter was emulsified? Well, whatever you did, keep doing it because that sauce looks completely perfect, and the dish as a whole is making my mouth water. Yes, there is a 10 pound tax for the crime of learning how to make Hollandaise sauce. We all have to pay it, unfortunately. If you like salmon, I recommend that you make some Hollandaise and add a few generous dashes of dill weed into it, and use an extra squeeze of lemon juice as well. Once in a while, especially for fish dishes, I like to use lime juice instead, or in addition to the lemon juice. Also, sometimes, instead of spicing it with powdered pepper, try a few dashes of cayenne pepper sauce, like Franks Red Hot. Also try adding a few drops of Worcestershire sauce once in a while. There are so many subtle ways to change it up, and it is a really fun sauce to experiment with. Haha! I’m so going to make this for my mom the next time she’s in town. She will love me for it, I know. Thank You!! I will try the salmon and dill recipe, I have salmon in my fridge from the salmon run in Alaska and this is going to be perfect for it! (I’ll post results!) I loved the idea of using fresh lime, there is a specific kind we use a lot in Hawaii called Calamansi (I love, they make lime-aid out of it, add it to teas, and it we add it to soy sauce, and all kinds of other things) It’s very acidic, but has a unique taste to it. I think I will try this next. Possibilities: Endless. Yes, please do post results. I love them! Also, I have not posted anything new in a few months so please don’t think the blog is dead, I have had some kitchen issues, so I have been unable to make new posts. I am moving very soon though so do keep checking back. I have big plans for this blog. Thanks for your kind words, and happy cooking! Try champagne vinegar! Its delicious, it almost didnt make it to the table tonight! I have never seen champagne vinegar, but maybe that is because I was not looking. I will look for it and if I find it I will definitely try it! I’d be interested to try this recipe! I’ve always avoided hollandaise sauce because I was told it had mayonnaise in it and I really hate vinegar. It sounds like it would be delicious! Who told you that!? I swear the misinformation about food in the world is astounding sometimes. Hollandaise is made in a similar manner as mayonnaise, but one does not contain the other! haha! Thank you for a splendid recipe! I’d wanted to try eggs Benedict, but been put off by the Hollandaise recipes I’d read. You provide just the right amount of detail. To those beginners like me, you really do need to use unsalted butter as it states in the recipe. Even lightly salted butter will produce an inedibly salty sauce. I assume this is because the salt is held in the disperse phase in butter, but the continuous phase in Hollandaise. If you can’t get unsalted butter (my nearest supplier is nineteen miles away), you can use salted if you clarify it carefully first, then thin the sauce with a little warm water. Wow, nineteen miles just for unsalted butter? It is incredible how in some areas the most basic of basic foods are hard to come by. Thank goodness I have no trouble finding unsalted butter around here. I cannot, however get grass fed butter here, which breaks my heart. Ontario has some kind of weird regulation against grass fed dairy products. Something about protecting the status-quo farmers, I think. Grass fed dairy is basically impossible to find, but for the very rare family farm that sells to the public, and they usually have their clients and cannot service many people in the general public. If I really do my politicing right, maybe I can obtain a pound or two in a given year, but that is just a bit too much work for very little reward. Grrrr. No need to be so gentle with the eggs. With the yolks acidified with lemon juice, there’s a good 20°F between thickening and curdling. Try making the sabayon in a sauce pan over medium-medium high heat. Just put the pan right on the burner and whisk briskly until it thickens. It will thicken suddenly all at once, then remove from the heat. Takes less than a minute. You can finish the whole sauce in a couple of minutes. and I could not taste the difference at all. It worked out great. Thank you Cooking Geek! Thank you for sharing your experience and I am very pleased to hear that you like the recipe and agree that it is pretty easy. I also agree that it is way overpriced in restaurants. Though I can see how preparing it in a restaurant for multiple orders can get to be a bit difficult. But making what you need at home is a breeze. You can actually make Hollandaise and Bearnaise easily, with no chance of breaking the emulsion, in an immersion blender inside the smoothie cup (or other vessel just a smidge wider than the head of the blender), in just a couple minutes. No whisking. You blend the yolks with the lemon juice (or vinegar reduction in the case of bearnaise), then slowly pour in melted butter (clarified if you’re a real geek) while moving the blender up and down in the mixture. You’ll get perfect, thick consistency in just a minute or two every time, since the vortex created by the blender in a narrow cup creates the emulsification. It is so nice that you have taken this occasion to present your own blog right in the midst of this wonderful helpful Hollandaise instructive posting. I don’t have a blog, just adding a helpful tip for those looking to save time. But isn’t your passive aggressiveness snarking precious, dear? I only just got my first immersion blender recently. I’m probably going to try this at some point. It’s okay I like tips and tricks. While my method is perfectly good and valid. There are other perfectly good and valid methods to do things. I will try your Spaghetti sauce & meatballs recipes. You have other recipes which have stated are to come at a later date. I’ve looked but to no avail can I find them. Are you still up and running? Thank you, again. It all sounds and looks DELICIOUS. Hello! I am still alive, still cooking, not currently posting recipes. All i can say is life got busy. I had kids for one thing. I also unfortunately moved into an apartment with a kitchen not conducive to cooking and especially preparing pictoral articles. No counter space at all. Currently looking for “the house” though. Once I have my dream kitchen I will be posting wth a vengeance and will probably change the site style a bit. Waaay over due for an upgrade! In the mean time, if there is a particular promised recipe that you want, ill be glad to provide.